When visualizing the future of retail, the majority of consumers and professionals talk about the increase in technology, digitalization, and online personalization. Companies are using new software and databases to increase delivery speed, recommend specific products to an individual, and make the overall experience of being in a store more tech-based. Starbucks, on the other hand, is taking an approach that is entirely unique, and that has left the media inspired and emphatically shocked. Now, what’s the excitement? A couple weeks ago, Starbucks opened up a new store in Washington, D.C. The store is not filled with robots or electronic-based ordering systems. There are not LED menu boards or personalized cups, either. The store is actually very similar to all the locations that are in the United States; however, it is actually an American Sign Language (ASL) store. Instead of amping up the technology, the company is actually putting a new spin on things in order to make the store less exclusive by attempting to cater to all consumers. This design is different from all locations around the world, simply because the company wants to include the deaf community in its stores and make is easier for them to communicate their orders to the baristas. 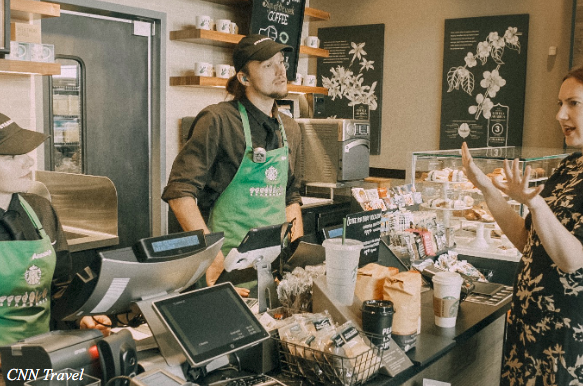 In addition, the baristas in the store are also deaf, which allows the customer to connect with them on a new level and interact with them from a different perspective. Marcus goes more in depth, writing that the store is trying to redefine inclusivity. The location is much more than just another store added to the list, but instead a movement in the right direction towards social equality. The store includes tablets at the registers for customers to write their orders down for the baristas. Marcus writes that “There is also a two-way communication tablet in case of questions such as ‘What kind of milk?.’” This is a new use of technology that is not just implemented for the sake of convenience, but for inclusivity. This should be the future of retail. Companies should be thinking outside of the box and focusing on improving the lives of all consumers. Advances should not just be for the technological aesthetic, but rather to make the consumer’s life easier. Technology should not be implemented in an arbitrary way, but instead hold a plausible purpose to increase convenience for the unaverage customer.